Meditation sessions were offered throughout the month to allow people to learn techniques for dealing with emotions that prompt uncivil behavior. In addition to offering programs related to civility, the library had books on display that dealt with civility and kindness. We purchased 15 copies each of the two featured books Choosing Civility by P. M. Forni and Treating People Well by Lea Berman and Jeremy Bernard. These books were selected for the library’s monthly book discussions. 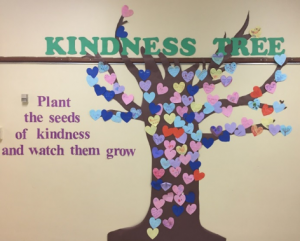 We also offered a number of children and teen programs that dealt with kindness and etiquette as well as some passive programs such as the “Kindness Tree” and “Post It Positivity Wall” to encourage patrons to think positive and kind thoughts. What kind of response have you received to your Revive Civility programs? It is difficult to measure the long-term impact of the Revive Civility initiative. 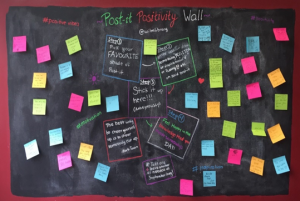 However, we believe that at some level awareness was raised and participants were hopeful that positive change is possible. Going forward, we plan to continue to address the topic of civility by periodically offering civility related programs. In addition, we plan to reach out to participants who provided us with their email surveying them on long term changes. 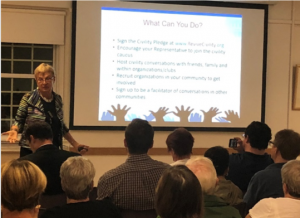 The keynote address by Dr. Carolyn Lukensmeyer drew the biggest audience, which included a number of local government leaders and representatives from local community groups. 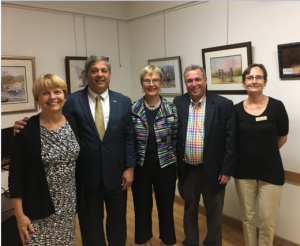 It should be noted that the Library Director personally reached out to state and local officials, candidates running for office and community representatives inviting them to the keynote address. In addition, we were able to include a Revive Civility postcard in the water bill mailing that went out to all Wilmington households. One thing we noticed is that the Revive Civility events attracted attendees who were new to the library. This may have been a result of outreach to all residents. What advice would you give librarians interested to offer similar programs promote civility? Having a knowledgeable keynote speaker, such as Dr. Lukensmeyer, who can speak directly to the issue providing historical context and proposed solutions, was a good starting point for the series. Libraries can then follow the keynote address with a variety of related programs that deal with civility. These programs can address such topics as diversity, fake news, social media, etiquette and how to deal with uncivil behavior, etc. Many participants throughout the month indicated that they thought that addressing civility was timely and important.